Laser ultrasonic technology has already been widely studied in numerous R&D centres. Aerospatiale and Dassault Aviation have made great advances in the use of this non contacting NDT method as they have acquired four years ago the first industrial prototype. This system called LUIS that stands for Laser ultrasonic Inspection System has been developed by the Canadian company Ultra Optec. It has proved to be highly performing on the foreseen applications, covering production and maintenance inspection for composite parts. LUIS capabilities are almost unmatched for the testing of parts with a complex geometry, either monolithic, stiffened or sandwich ones. Until last year, most of the evaluation of the system had been made in a laboratory in a R&D environment . To complete this first step and to fully use the unique abilities of the LUIS system, it has been decided to set up on site validation tests. The tests have been conducted in both production and maintenance environments. The LUIS system operation is based on the use of laser beams for the generation and detection of ultrasonic waves . Ultrasonic waves are generated with a CO2 laser in the thermoelastic mode, to ensure that the process is nondestructive. The detection is based on wave velocity measurement, using the Doppler effect, and associates a narrow band Nd:YAG laser and a confocal Fabry-Pérot. Such optical generation and detection suppress most of the constraints met in conventional ultrasonic testing : no coupling, neither normality nor constant distance requirements. Using a well-adapted scanning system based on two rotation axes, the LUIS is able to inspect parts of complex geometry with easy implementation. The system itself is made out of three units : the generation unit, that comprises the scanning system, the detection unit, linked through optical fibres, and the monitoring unit. In the laboratory configuration, both detection and monitoring units were stationary and the generation unit could be moved within a radius of 5 meters. Usually, the part to be inspected would be placed facing the scanning mirror, within the working distance ranging from 1,2 m to 2,4 m.
The laser ultrasonic system presents unique abilities that had first to be further evaluated and validated in real conditions. 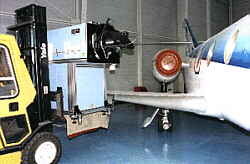 Some tests had already been performed in an aircraft maintenance site by the IMI in Canada  with their laser ultrasonic demonstrator. The results looked very encouraging; our study has been based on part of those results and aimed at achieving effective mobility as described below. The first study objective was the obtention of easy displacement of the system within a larger radius of action. It also was to ensure easy and quick implementation of the system in any plant of both companies. This last point had been pointed out as essential to enable on-site validation of the laser ultrasonic technology and to evaluate its abilities to solve NDT of developing products or to answer expertise needs. To achieve this mobility, a shelter has been designed as a laboratory container in which the three units could be fixed .The shelter has been set up on a trailer in order to achieve mobility between plants (see Figure 1). Each of the units has been mounted on damping elements to ensure the protection of sensitive optical parts. 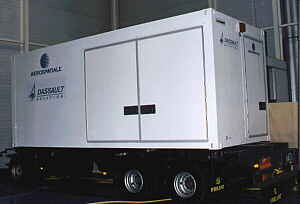 The trailer itself possesses its own pneumatic damping system in order to limit mechanical vibrations during road transportation. In an on-site configuration, it is only necessary to connect the general water and energy inputs of the shelter. 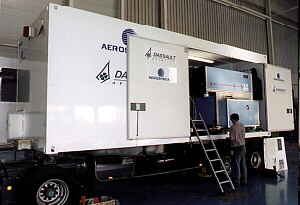 The scanning unit is mobile in a radius of 30 m around the shelter, which appears as a major improvement if compared with the original 5 m available in the laboratory configuration. The different tests performed in various locations have shown that only two people could get the system operative in half a day. The maintenance tests have been conducted in the facilities of Dassault Falcon Service, in the business airport of Le Bourget. A Falcon 10 jet had been selected for these tests as it presents the unique characteristics of having a composite wing. This wing is the result of a former Aerospatiale - Dassault Aviation common research programme that lead to the first certified graphite-epoxy wing. 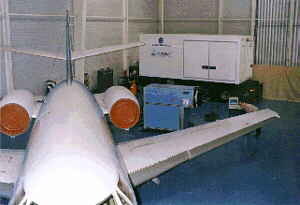 The shelter has been installed in the maintenance hangar near the aircraft and it was only necessary to establish a security area, using curtains (see Figure 2). In order to inspect the wing horizontal surfaces, it has been necessary to use an intermediate reflection mirror positioned on a photo tripod. Surfaces with listed delaminations have been tested. The amplitude and time of flight C-Scans (see Figure 3) show clearly these flaws. The comparison with a semi-manual system, the CURTIS, shows similar detection of the defects, but the implementation of the testing is much easier with the LUIS and the scanning is quicker. Under these conditions, the size of the scanned area was not a constraint. 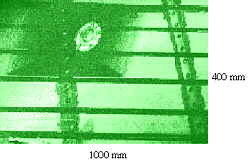 The surface was 1000mm x 400 mm, inducing laser beam angle with the part up to 60° with respect to the normal. This was indeed the limit in this case as the absence of autofocusing system leads to a unusable signal in the upper left corner of the area. Some metallic panels of the rudder and the fuselage have also been tested. 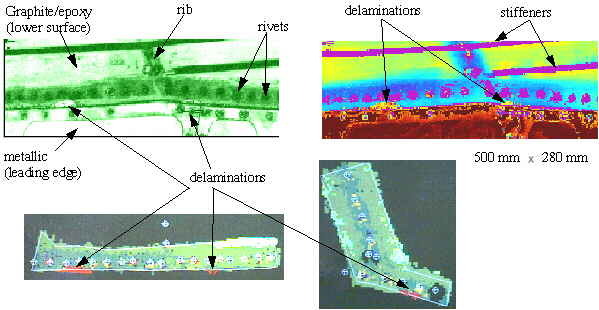 There are no listed defects in these zones but the scans highlight the structure of the parts (see Figure 5) : rivet lines, stiffened zones, damping blocks. To evaluate the behaviour of the system in an on-site environment and to validate its performances on production parts, the LUIS has been moved to Aerospatiale plant of Nantes. The system could be installed in a NDT area, near other testing systems. As in Le Bourget, the security of the zone has been achieved using curtains around the laser area. Production parts have been selected to be inspected following two criterias. The first criterion was a geometrical one. Most of the parts with complex geometry that require partly or complete manual inspection have been tested to evaluate the exact profit brought by the laser ultrasonic system. Moreover, when possible, some parts with listed heterogeneities have been also tested. Depending on their type and gravity, the parts were rejected or accepted parts. Two fin horns have been tested with the LUIS. The structure is mostly a sandwich (honeycomb core) with a monolithic border. The parts present a slight curvature and have to be manually inspected. These horns contained defects in the monolithic part of the structure that lead to rejection. The curvature could be followed without any problem by the LUIS scanning system and the detection of both defects was confirmed (see Figure 6). A leading edge is very interesting as it is representative for a strong curvature. Standard testing method on this part is manual ultrasonic. One part has been tested with laser ultrasonics. 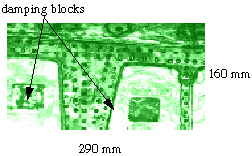 and it was possible to inspect all of it in two scans (see Figure 7 and Figure 8) : one scan per half of the part. This part is interesting to test the geometry limit of the laser ultrasonics method. The tolerance for the incident beams is indeed very wide and in this case, we have angles larger than 45° with respect to the surface normal. Further tests have been realised on a wing spar in which porosity had been detected in the radius. Due to the geometry, testing on this part is manual ultrasonics, as for the leading edge. In the same way, the spar could be fully tested using two scans, one on each radius. The reference sample for this part has also been tested (see Figure 9). The porosity zone has been confirmed with the LUIS (see Figure 10); moreover it has been possible to state on its extension : the porosity is below the rejection limit. The LUIS system integrated in a shelter has proved that it could work in an industrial environment as in an aeronautical maintenance or production site. Its testing performances have been kept unchanged throughout the modifications that had to be performed and they are not disturbed by the outer constraints (vibrations, dust, ...). The implementation (and transport preparation) of the system in a new site is quite quick if all necessary connections are taken into account (energy, computer links, optical links). Once the system is installed, testing requires only a few minutes of preparation and the scanning itself is of equivalent duration compared to current automatised systems. Prospects are numerous for the technology and its applications. The availability of this mobile system will be the key to answer expertise needs in composite manufacturing. It will also make it possible to have a base to define requirements and to test modifications in a actual on-site configuration to prepare tomorrow's systems. The results presented here above have been supported by the SPAe / CTMS. We also thank greatfully all people from Dassault Falcon Service and Aerospatiale Nantes for their welcome and help in performing the tests.